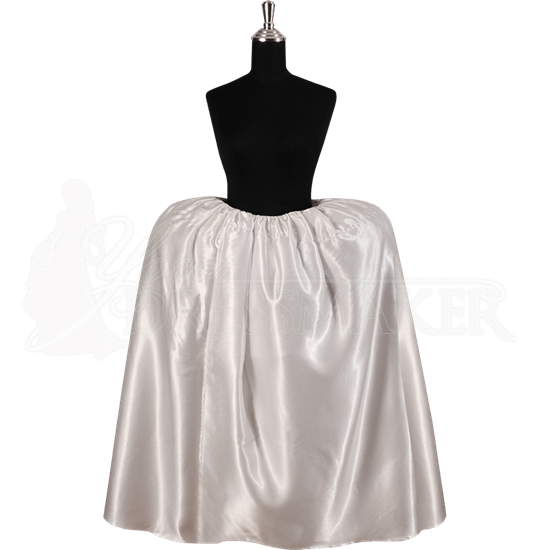 A pannier is quite similar to a hoop-skirt in function, although it creates a completely different look. Our Renaissance Pannier compliments several of our baroque renaissance dresses nicely, giving them an extremely distinctive and classical shape. Like a hoop-skirt, a pannier serves to add shape to any dress, skirt, or gown a woman may wear. Unlike a hoop-skirt, a pannier doesn't create a perfectly rounded, conical shape. Instead, a pannier creates an extremely wide waist while adding much less to the front and back of the dress. Please note that unlike petticoats and hoop-skirts, not all dresses can be easily worn with a pannier, the pannier creates a distinctive shape that typically requires additional fabric on the waist of the gown, dress, or skirt. This pannier measures approximately 35 inches by 14 inches, and is designed to complement several of our own baroque and renaissance gowns. The Renaissance Pannier is the perfect accessory to pair with any Baroque or Renaissance-era gowns or dresses, with a pannier, these dresses have an extremely distinctive and unique shape that is most-commonly associated with royalty and nobility.